Researchers have demonstrated a unique carbon capture and storage process that can convert carbon dioxide into environmentally friendly limestone in less than two years. Carbon dioxide is a major greenhouse gas contributing to global warming. Unfortunately, current options for carbon dioxide storage are very not effective, prompting Dr. Juerg Matter's team to try something new. To test their idea, the team partnered with Reykjavik Energy, a Geothermal Power plant in Iceland. 220 tonnes of carbon dioxide captured from this power plant was mixed with water to form fizzy water. The fizzy water was then pumped underground into volcanic basalt rock. Since this water is acidic, it dissolves calcium and magnesium in the basalt rock. These minerals then reacted with the carbon dioxide converting it into calcium or magnesium carbonate, also known as limestone. There is no competition with domestic water supplies because the carbon dioxide is injected much deeper than drinking water wells. The team also tested the deeper ground water to ensure that all of the metals leached from the basalt rock by the fizzy water were solidified into the limestone formations. This conversion process does happen naturally, but is extremely slow. Hence, when the project was first proposed, it was believed that the injected carbon dioxide would take thousands of years to be permanently sequestered. To everyone's surprise, rock samples extracted after only two years showed 95% conversion of the greenhouse gas. Due to the speed of the process, power plants around the world are interested in the new technology. Fortunately, the process may be quite widely applicable because the key ingredient, basalt rock, is reasonably common and can be found on every continent and all over the ocean floor. The team is now upscaling their process. 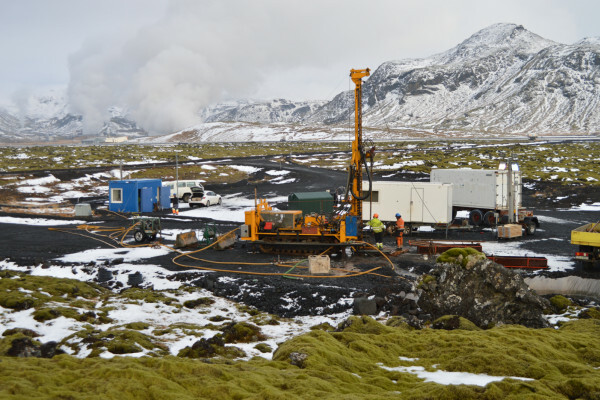 Even though, geothermal energy is a renewable energy source, the plant still produces 40 000 tonnes of carbon dioxide due to the natural emissions from the magma. Their goal is to make the Reykjavik power plant emission free.